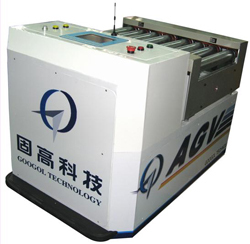 Multi-frequency magnetic guiding Automated Guided Vehicle (AGV) is a comprehensively projected product, which combines vehicle mechanical technology, human-machine interface, mechatronics, SCM, data fusion, real time digital signal processing, trajectory planning, multiple AI object coordination, and wireless communication theories and technology together. It is a typical intelligent system, as well as a model for the research development of multiple AI system and multiple vehicles control. Its theory and technology can be applied in industrial production, factory automatic logistics system, rescue and other practical fields, thus it has high research and application value. It can accept dispatch commands and follow the instruction accordingly. It picks and places stuff to their corresponding locations and sends the messages to the PC when it＊s done. Messages of current status of the vehicle, and environment are also sent back to the PC for better control and management. Vehicle dispatch & pick up Basic function in the production process. The AGV normally remains in stand-by mode if it doesn＊t receive the production dispatch mission command. Once receiving the command from the workstation, it will execute the pick up (onto the tray) and transportation process automatically and fulfils the system dispatch function.